I have an enquiry in here from old friend of the blog Peter Chadbund who’s long had an interest in the life, times and work of respected Norton Canes local historian and writer Jack Harrison. Jack wrote the sought after and in some quarters controversial book ‘The King of Norton Canes‘ amongst other works, a title that remains sought after and discussed to this day. The book was published in 1990 and like Jack’s earlier work ‘Above the Black Diamionds’, is now very hard hard to get hold of. Well, Peter is trying to find out what became of Jack. I’ll let him explain. A very hard book to find now. You may recall that we corresponded some time ago withregard to Jack Harrison’s books. I am trying to tie up the loose ends of various things, including miscellaneous notes that I made about Jack and his tales. The reson for my contacting you is to ask if you know when Jack died – I was told that he passed away a few years ago (if he was still alive he would be 110!) but I cannot find anything on the internet about his death (in fact there is very little about him at all on there). Years back when I was singing around the folk clubs I put togerther a little “show” telling about Jack’s life and singing songs based on some of his stories, which I would like to compile into a readable document, thus it seems only fitting that I should include the date of his passing. If you can help, please do get in touch – Comment here, hit me up on social media or mail me: BrownhillsBob at Googlemail dot com. Cheers. This entry was posted in Brownhills stuff, Cannock Chase, Chasewater, Fun stuff to see and do, Local History, Local media, News, Reader enquiries, Shared media, Shared memories, Social Media, Spotted whilst browsing the web and tagged Above the Black Diamonds, Books, Cannock, history, Jack Harrison, Lichfield, Local History, mining, Norton, publications, Staffordshire, The King of Norton Canes, Things to do. Bookmark the permalink. 11 Responses to Can you help tell the story of a local historian please? Happy to have a look. What was his proper name? John? Middle name(s)? Where and when (1908?) born? In fact two men died in this incident. There is very little written in the Lichfield Mercury, even though questions were asked in the House. It would not surprise me if the “establishment” were not best pleased with the description. 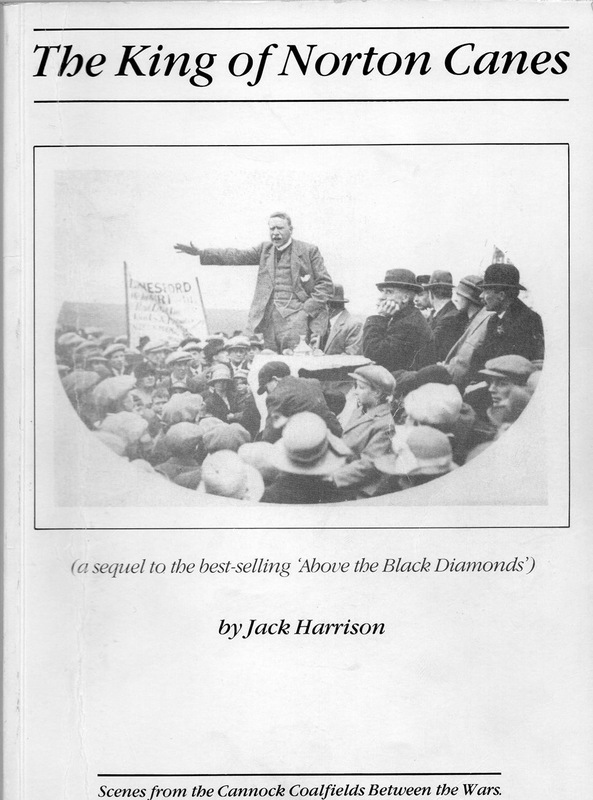 Has anyone located “Above the Black Diamonds?” It many contain much of interest to anyone studying the social side of mining on Cannock Chase. I borrowed this book a few years ago, “The King of Norton Canes”, from a friend who lived in Norton Canes, who sadly pass away a few Years ago, i wish now that i’d tried to have brought it, a very good read,pity you can not buy it now unless you are lucky to drop on a second hand one. Yes, Pete, I agree with Reg that it must be a good decade or more that Jack passed on. I was in touch with him for a while prior to that. One of my last fond memories of him was that he made a request to hear Tackeroo Junction’s Mermaid, the B Side to our Come On Wolves, on the Richard Walker Folk Sow in the week that we were disbandng the band and the Traf Club in the early 90s. Of course, Pete you and I appeared together for interview on the Richard Walker Folk Show on Radio Shropshire sometime prior to that. Hi I’m Jack Harrison’s granddaughter. In response to the original post from Peter Chadbund my grandad passed away in October 2000. He was 93 years. Hope this helps you compile your document.